Nursery rhymes like ‘Mary Had a Little Lamb’ and ‘Twinkle Twinkly Little Star’ are part of every person’s childhood days. Such songs are easy to remember and fun to listen to simply because of the way the verses rhyme. 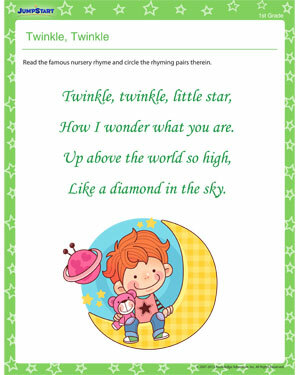 Let your first graders rediscover the nursery rhyme ‘Twinkle Twinkle Little Star’ with this fun rhyming worksheet. Ask your students to identify and circle the rhyming words in the song. Chances are your kids never even realized that the nursery rhyme had rhyming words!